Powers: Harness his spiritual energy, or chi, to augment his physical and mental capabilities to peak human levels. By focusing his chi into his hand, he can tap the superhuman energy of Shou-Lao and temporarily render his fist into a living weapon. Abilities: An exceptional athlete, acrobat, and hand-to-hand combatant. He is a master of all of K’un-Lun’s martial arts and many of Earth’s, trained in the use of virtually all martial arts weapons. He has near-complete control over his nervous system. Iron Fist, aka Daniel “Danny” Rand, is a superhero appearing in comic books published by Marvel Comics. He was created by Roy Thomas and Gil Kane, and made his first appeared in Marvel Premiere #15 in May of 1974. He is a practitioner of martial arts and the wielder of a mystical force known as the Iron Fist, which allows him to summon and focus his chi. Daniel Rand was born to Wendell and Heather Rand in New York City. Wendell Rand had, as a youth, visited the mystical city of K’un-Lun, which materialized in the Himalayas once a decade. K’un-Lun was founded roughly a million years ago by extraterrestrials, and was co-ruled by the aliens’ descendants and powerful beings called the Dragon Kings. They were all subjects to the godlike sorcerer Master Khan. A young Wendell Rand had saved the life of K’un-Lun’s ruler Lord Tuan, who adopted Rand as his heir, to the resentment of Tuan’s son, Yu-Ti. During his time in K’un-Lun, Wendell Rand married a woman named Shakari and fathered a daughter, Miranda Rand-K’ai. At some point, Rand won ritual combat against Davos, son of K’un-Lun’s greatest warrior, Lei Kung the Thunderer, which entitled him to claim the power of Shou-Lao the Undying, a man transformed into a mystic serpent over a thousand years ago by the Dragon King Chiantang; however, although great K’un-Lun warriors had periodically wielded Shou-Lao’s power as the Iron Fist, Rand declined the power. Ten years after coming to K’un-Lun, Rand was showing Shakari the restored nexus when Yu-Ti’s men attacked them. Shakari was slain, and the grief-stricken Rand returned to New York. Within a year, he became a wealthy businessman and married Heather Duncan. In his absence, Lord Tuan died and became ruler of Feng-Tu, abode of K’un-Lun’s departed spirits, leaving Yu-Ti to rule K’un-Lun, while Lei Kung, shamed by Davos’ defeat, banished his son to Earth. When Daniel Rand was nine, Wendell organized an expedition to seek out K’un-Lun at roughly the time mystical city was scheduled to re-materialize. His father decided to bring him and Heather to K’un-Lun, accompanied by Rand’s business partner Harold Meachum. While traveling through the Himalayas, Wendell fell from a mountain ledge; while clutching the edge, he called to Meachum for help, but Meachum, hoping to control Rand’s business shares and having a love interest in Heather, caused Wendell to plunge to his death. Shortly afterward, Heather and Daniel come across a makeshift bridge that appears out of nowhere and are attacked by a pack of wolves. Heather throws herself on the wolves to save Daniel and is killed even as archers from K’un-Lun attempt to save her, her spirit ascended to Feng-Tu. The archers take the grieving Daniel to see Yu-Ti, the hooded ruler of K’un L’un. When Daniel expresses his desire for vengeance, Yü-Ti apprentices him to Lei Kung, the Thunderer, who teaches him the martial arts. Vowing to avenge his parents, Daniel Rand studied martial arts under Lei Kung while growing up in K’un-Lun. Daniel proves to be the most gifted of Lei Kung’s students, conditioning his fists by plunging them into buckets of sand, gravel, and rock to toughen them. His closest friends growing up in K’un-Lun were Miranda Rand-K’ai, whom he did not know was his half-sister, and a K’un-Lun boy named Conal D’hu-Tsien. At 19, Daniel is given the opportunity to attain the power of the Iron Fist by fighting and defeating the dragon Shou-Lao the Undying, who guards the molten heart that had been torn from its body. This was a feat no other warrior had ever accomplished. During the battle, Daniel throws himself against the scar of Shou-Lao, which burns a dragon tattoo into his chest. Having killed Shou-Lao, he enters its cave and plunges his fists into a flaming brazier containing the creature’s molten heart, emerging with the power of the Iron Fist. It is later revealed that Daniel is part of a long lineage of Iron Fists. When K’un-Lun reappears on Earth after 10 years, Daniel leaves to find his father’s killer. Returning to New York, Daniel Rand, dressed in the ceremonial garb of the Iron Fist, seeks out Harold Meachum, now head of Meachum Industries. Meachum knew of Danny’s return and placed a bounty of ten thousand dollars on his head and after overcoming a number of attempts on his life, he confronts Meachum in his office, only to find the man legless—an amputation carried out when, after abandoning Daniel and his mother, he was caught in heavy snow and his legs became frostbitten. Rand took pity on him and spared him, and as he turns to walk away at that moment Meachum is murdered by a mysterious ninja. Meachum’s daughter Joy blames Iron Fist for the death, but he is eventually able to clear his name. This marks the beginning of his superhero career. 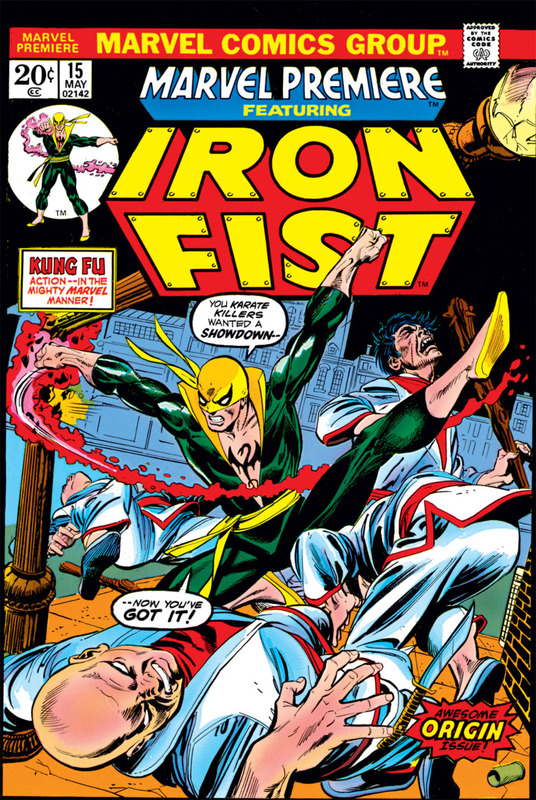 Over the next few months, Iron Fist became a noted crimefighter and clashed with enemies such as Master Khan, Scimitar, Chaka, the Wrecking Crew, Drom, the Backwards Man and Sabretooth. He sometimes worked with other heroic martial artists such as the Sons of the Tiger, the White Tiger, and Shang-Chi, the latter helping him save K’un-Lun from the sorcerer Quan-St’ar. Iron Fist then faced Davos, Lei Kung’s banished son, who sought to steal the Iron Fist power. Also calling himself Steel Serpent, Davos briefly succeeded in usurping the power before losing it back to and being defeated by Iron Fist; his soul was imprisoned within the alien Contemplator’s Anomaly Gem. Iron Fist became Misty Knight’s lover; he defended her from Luke Cage, a super-strong mercenary blackmailed into serving Knight’s enemy, Bushmaster after Knight had infiltrated the organization. When Bushmaster discovers Knight’s treachery, he kidnaps Claire Temple and Noah Burstein, the close associates of Luke Cage, better known as Power Man, holding them hostage to force Cage to eliminate Knight. Iron Fist is on hand to stop him, however, and after a battle, the truth comes out. Rand helps Cage and the Daughters of the Dragon (Knight and Wing) battle Bushmaster, rescue Temple and Burstein, and obtain evidence that proves Cage’s innocence of prior drug charges. 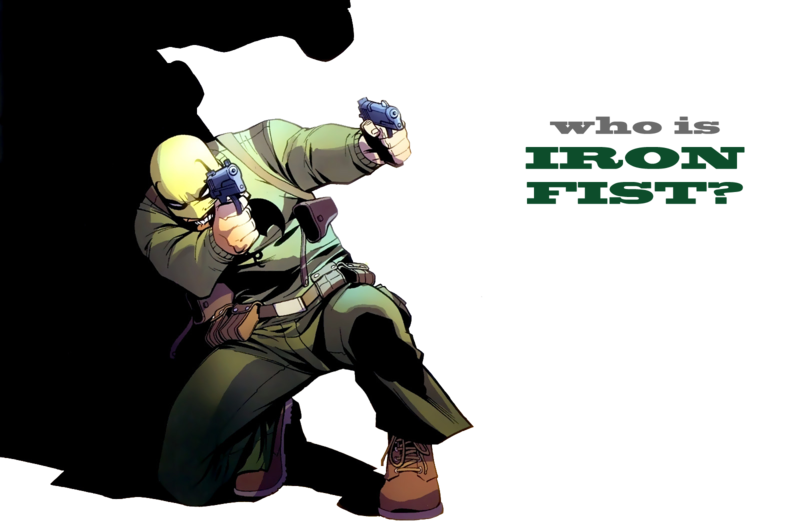 Iron Fist, Knight, and Colleen Wing helped Cage break Bushmaster’s hold, and Iron Fist soon formed a partnership with Cage as Heroes for Hire, Inc., taking assignments as bodyguards and private investigators. While Iron Fist and the cynically down-to-earth Cage were very different, they shared a dedication to justice and became best friends. Soon, Iron Fist and Cage confronted Master Khan, whom they pursued to K’un-Lun. Reunited with Lei Kung, Iron Fist was appalled to learn that the population had been decimated, and he and Cage led K’un-Lun’s remaining warriors against their foes; however, Iron Fist’s time on Earth had changed him, and he became disillusioned by K’un-Lun’s regimented culture. He was then captured by his adoptive uncle, Yu-Ti, who hoped to use him to appease Master Khan; however, even Khan feared the full power of the Iron Fist and was threatened into releasing his enemies. Iron Fist destroyed the mystic emerald that stabilized K’un-Lun’s link to Earth, making future interfaces unpredictable, then returned to New York with Cage. Khan himself became trapped on Earth and was unable to prevent Chiantang from escaping and almost destroying K’un-Lun. Iron Fist, in his secret identity of Daniel Rand, resumes control of his parents’ fortune as half of Rand-Meachum, Inc., making him quite wealthy. This causes tension between him and Cage, who was raised poor. Power Man and Iron Fist’s partnership ends with Rand contracting cancer and being kidnapped as part of a plot masterminded by Master Khan. Just prior to a battle with the Black Dragon Chiantang (the brother of the mythical Dragon King), Danny is replaced by a doppelgänger created by the extra-dimensional H’ylthri. The double (who wears a red variant of the Iron Fist costume) is killed by Captain Hero a short time later. Cage becomes a fugitive as the prime suspect in Rand’s apparent death. While in stasis in K’un-L’un with the H’ylthri, Iron Fist manages to focus his chi, curing his cancer. He is later freed from stasis by Namor. Upon returning to New York, Rand and Cage reform Heroes for Hire, Inc. with an expanded team, this time working for Namor’s Oracle Corporation. Namor ultimately dissolves Oracle as well as Heroes for Hire, Inc.
Iron Fist later loses his powers to Junzo Muto, the young leader of the Hand, and subsequently becomes the guardian of a pack of displaced dragons in Tokyo. His powers are eventually restored by Chiantang, who brainwashes Iron Fist and forces him to battle Black Panther. Black Panther is able to free Iron Fist from the creature’s control, and the two work together to defeat the Black Dragon in Wakanda. Rand took up the mantle of Daredevil to convince the media and the public that Matt Murdock was not the masked vigilante. During Marvel’s Civil War, Rand opposed the Superhuman Registration Act, joining Captain America’s New Avengers, an underground group provided with secure accommodation by Doctor Strange and which includes his former teammate Luke Cage. All the while, Rand was still pretending to be Daredevil. Rand was apprehended by Pro-Registration forces and was sent to the Negative Zone Prison, where he was later freed, joining Captain America’s team to battle Iron Man’s forces. After the arrest of Captain America and still in the public eye, Rand is able to avoid arrest with legal loopholes. He leaves the New Avengers due to a variety of problems but lets them know if they ever need him to give him a call. He later aids the New Avengers in locating and rescuing Cage from Norman Osborn after he suffered a heart attack and was summarily taken into custody as a fugitive. During this time, a Chinese business man showed interest in a contract with the Rand Company, Danny became suspicious and ended up badly battered after a fight with Hydra. He then felt someone else using the power of the Iron Fist, and met his predecessor, Orson Randall, who informed him that he not only knew his father, but taught him as well. He followed Orson down to his father’s secret subway station, was given the Book of the Iron Fist and was told that the history and truth of his title was in this book, and that it would prepare him for the Tournament of the Heavenly cities. After battling the Steel Serpent, Orson sacrificed himself, but before dying, he allowed Danny to touch his heart and take his chi. Danny rose to fight the Steel Serpent as equals, now with the powers of Orson Randall within him, but Danny was summoned back to K’un-Lun by his master Lei Kung for the tournament. The tournament consisted not only of K’un-Lun but also the six other cities of Heaven. Together these seven cities formed the Heart of Heaven; the arena where the tournament was held. Each city had an immortal weapon to represent it, each with their own unique abilities. Rand was chosen to first fight the enormous Fat Cobra, but the blinding speed and fighting prowess of this opponent was too much for him. Iron Fist lost the match. However, losing benefited Rand for he was able to travel back to Earth and visit with a man named Ernst Erskine to find out more about his predecessor, Orson Randall. During his stay, Danny saved Ernst and his associates, formerly known as the Confederates of the Curious, from being killed by agents of Hydra. Upon his return to K’un-Lun, Danny found an ally in the Prince of Orphans, another immortal weapon also familiar with Randall. Together the two of them helped unite the other tournament combatants against Hydra and their newest benefactor, a man known only as Xao. Xao wanted to destroy K’un-Lun, but in the process he would have destroyed the other cities as well. This new team of Immortal Weapons easily defeated Hydra and foiled Xao’s plans. Meanwhile, Lei Kung and his Army of Thunder cast out the corrupt Yu-Ti, and Kung took his place. The Immortal Weapons decided to remain on Earth to assist Iron Fist in finding a rumored Eighth Capital City of Heaven, and after a near death experience for Danny at the hands of Zhou Cheng, servant of the monstrous Ch’i-Lin, they had. He and the other Immortal Weapons journeyed to the Eighth City to free political prisoners exiled there by past rulers of K’un-Lun, but they were imprisoned by the city’s ruler, ancient Iron Fist (Quan Yaozu). After escaping with the other Weapons, Rand returned to Earth, learning his company had largely collapsed; he used his remaining funds to open the Rand Foundation, a philanthropic organization. He also learned his fiancée, Misty Knight, was apparently pregnant; both were unaware his chi energy had caused a false pregnancy. When Steve Rogers placed Cage in charge of a new team of Avengers based out of the rebuilt Avengers Mansion, Rand joined. Before long, the team was embroiled in a war with the mystical entity Agamotto, who wished to reclaim Dr. Stephen Strange’s Eye of Agamotto amulet; during this, Iron Fist was drawn into Agamotto’s dimension, where Agamotto marked Rand as his champion with a new white costume. Orson Randall, Daniel Rand’s immediate predecessor, seeked out Daniel Rand in New York and gave him The Book of the Iron Fist, a sacred ledger supposedly containing all the Kung-fu secrets of previous Iron Fists, which Randall claimed was be necessary if Rand was to compete successfully in the coming tournament of the Seven Champions. The Steel Serpent, whose powers had been greatly augmented by Crane Mother, dispatched Randall. On the brink of death, Randall surrenders his Chi to Rand, giving him sufficient power to battle the Serpent to a standstill. After the battle, Rand is summoned by his master, Lei Kung (who is also the father of Steel Serpent) to compete in a tournament that will decide the cycle according to which each of the Seven Cities of Heaven appears on Earth. However, the leaders of the Seven Cities had secretly erected gateways between Earth and each city without the knowledge of the populace. The corruption of the leaders of the Seven Cities of Heaven spurs Iron Fist, Lei Kung, Orson Randall’s daughter, and John Aman to plan a revolution. Iron Fist discovers that Crane Mother and Xao, a high-ranking HYDRA operative, are planning to destroy K’un-Lun by using a portal. Upon learning of the plot Steel Serpent helps Rand and the other Immortal weapons defeat Xao. After learning that the Randall fortune that started Rand International was formed from the oppression of the Cities of Heaven, Rand decided to transform the company into a non-profit organization, dedicated to helping the poor. He also sets up the Thunder Dojo in Harlem to help inner city children, buys back the old Heroes for Hire building as the new Rand International Headquarters, and his new home, while offering Luke Cage a position at the company. He also tries to reconnect with Misty Knight. Soon afterward Rand is attacked and defeated by Zhou Cheng, a servant of Ch’l-Lin, who claims to have killed the Iron Fists in order to enter K’un Lun and devour the egg that births the next Shou-Lao the Undying every generation, thus wiping out K’un Lun’s Iron Fist legacy. Luke, Misty, and Coleen arrive and save Rand. Rand has his shoulder dislocated during in a second battle with Cheng, but manages to defeat Cheng even in his weakened state. Following the duel, the Immortal Weapons, Luke, Coleen, and Misty arrive, and reveal to Rand that they have discovered a map in Cheng’s apartment that leads to the Eighth City of Heaven. Rand and the others realize that this is where the Ch’l-Lin originated, and depart for the Eighth City. In the Eighth city he meets Quan Yaozu, the first Iron Fist, who became disillusioned with K’un-Lun and rose up to rule the Eighth City as Changming. Rand and Fat Cobra manage to defeat Quan. Rand’s actions during their battles impress Quan, who decides that Rand may be living proof that K’un Lun is not the corrupt city it once was. Rand and Davos agree to guide Quan to K’un Lun and arrange a meeting between him and Lei-Kung to give Quan a forum for his grievances. However, when Rand returns to New York, he finds a HYDRA cell waiting for him at Rand International, seeking retribution for the death of Xao, and holding Misty hostage. In the ensuing battle, Rand International is destroyed, but Rand and Misty escape unharmed. Now left with only a fraction of his former net worth, Rand and Misty purchase a new condo in Harlem, and Rand decides to focus all of his attention and remaining resources at the Thunder Dojo. While moving into their new home, Rand asks Misty to marry him. Initially skeptical of the offer, Misty accepts and reveals that she is pregnant with Rand’s child. After finding out that Misty’s pregnancy was false, Misty and Danny decide to move out of their apartment and live separately, but continue their relationship.